Charles Guignebert (1867–1939) was born in the Val-de-Marne, into a family of artisans that was not particularly pious. Despite his secular upbringing he became interested in the history of Christianity and studied under Ernest Renan, obtaining a doctorate in the field with a thesis on Tertullian. From 1906 he was a professor of history at the Sorbonne. 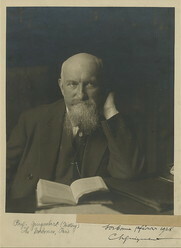 In 1919 Guignebert assumed the chair of the History of Christianity faculty there, a position he held until 1937. Guignebert believed in the “historicity of Jesus,” (Dictionnaire Rationaliste, “Guignebert”) and it has been pointed out that, in his 1933 book Jésus, Guignebert combats six mythicist thinkers (Couchoud, Benjamin Smith, Robertson, Jensen, Kalthoff and Drews—English edition, pp. 68-75). Essentially a rationalist, he still took his point de depart from the various conflicting stories provided by the evangelists, attempting to make sense of them while weighing the different sides of even the thorniest questions. In my opinion, Guignebert effectively poked so many holes in the fabric of the gospel Jesus that nothing solid remains. In this way the historicist has unwittingly paved the way for the mythicist. Guignebert was at heart a neutral historian—a “scientist” in the best sense. While critical junctures in his argument fail, they most often fail not for lack of reasoning but rather for lack of data. The fault is not to be laid entirely at his feet, for Guignebert did the best he could with the facts at hand. However, the facts have changed mightily since Guignebert wrote almost a century ago. We now have the Nag Hammadi material, the Dead Sea Scrolls, the maturation of archaeology, and the recent advances of scholarship. Guignebert’s arguments—defensible perhaps when Jesus appeared—are no longer valid and must be revisited because the facts have changed. Were he alive today, it is my opinion that the probative Guignebert would number himself among the mythicists. Like many historicists who harbor grave doubts regarding the gospel stories, Guignebert was not able to take the final step and jettison the gospel Jesus. This step can only be made when one separates the authentic sayings material (to be found among the logia and parables) from the obviously contrived biographical material. Though Guignebert sensed that a human being underlay the Christian message, the grand solution eluded him: that human being—certainly a remarkable prophet—indeed had nothing to do with the biography of Jesus, but his voice still strongly resonates in the utterances that have been preserved.